Thank you to Lori for passing this hint along……. Didn’t know this one – If you are baking a cake and are an egg short, blend in a couple of tablespoons of mayonnaise. Coleslaw (also known as cole slaw or simply slaw) is a salad consisting primarily of finely shredded raw cabbage and dressed most commonly with a vinaigrette salad dressing. Prepared in this manner, coleslaw can be pickled for up to four weeks if it is stored in an airtight container. Another way to make coleslaw is to use foods that already contain vinaigrette: mayonnaise, for example, is commonly used. Coleslaw is frequently served as a side dish in traditional meals in many countries, and can be seen in major fast food chains as well. There are many variations of the recipe, which include the addition of other ingredients such as red cabbage, pepper, shredded carrots, onion, grated cheese, pineapple, or apple, mixed with a salad dressing such as mayonnaise or cream. A variety of seasonings, such as celery seed, may be added. The cabbage may come in finely minced pieces, shredded strips, or small squares. Other slaw variants include broccoli slaw, which uses shredded raw broccoli in place of the cabbage. Cream, sour cream, or buttermilk are also popular additions. Buttermilk coleslaw is most commonly found in the southern United States. In the United States, coleslaw often contains buttermilk, mayonnaise or mayonnaise substitutes, and carrot, although many regional variations exist, and recipes incorporating prepared mustard or vinegar without the dairy and mayonnaise are also common. Barbecue slaw, also known as red slaw, is made using ketchup and vinegar rather than mayonnaise. It is an essential part of “Lexington style” North Carolina barbecue. Coleslaw is generally eaten as a side dish with foods such as fried chicken and barbecued meats and may be accompanied by French fries or potato salad as another side dish. It also may be used as a sandwich ingredient, being placed on barbecue sandwiches, hamburgers, and hot dogs along with chili and hot mustard. A vinegar-based coleslaw is the signature ingredient to a Primanti Brothers sandwich. Coleslaw also is used on a variant of the Reuben sandwich, with coleslaw substituting for the sauerkraut; the sandwich is commonly called a Rachel to differentiate it from the Reuben. According to The Joy of Cooking (1997), raw cabbage is the only entirely consistent ingredient in coleslaw; the type of cabbage, dressing, and added ingredients vary widely. Vinaigrette, mayonnaise, and sour cream based dressings are all listed; bacon, carrots, bell peppers, pineapple, pickles, onions, and herbs are specifically mentioned as possible added ingredients. Ham salad is a traditional Anglo-American salad. Ham salad resembles chicken salad, egg salad, and tuna salad (as well as starch-based salads like potato salad, macaroni salad, and pea salad): the primary ingredient, ham, is mixed with smaller amounts of chopped vegetables or relishes, and the whole is bound with liberal amounts of a mayonnaise, salad cream, or other similar style of salad dressing, such as Miracle Whip. Ham salad generally includes cooked, cold ham which has been minced, cubed, or ground; the mayonnaise or other dressing; diced sour or sweet cucumber pickles or cucumber pickle relish; and perhaps chopped raw celery, green pepper, or onion. Raw cucumber, shredded carrot, pimento, sweet corn kernels, or tomato are sometimes used. Very often, the salad is mixed or garnished with generous quantities of chopped hard-boiled egg; less frequently, grated cheese may be used, or peas or boiled potato may be added to bulk out the dish. The salad is kept chilled until serving. Like other mayonnaise-bound meat salads, the finished dish typically has a chunky, grainy, or pasty texture, and is frequently served as a spread upon crackers or upon bread in a sandwich. Ham salad is still very popular in western Pennsylvania, and is also fairly popular in the Upper Midwest, Mid-Atlantic and Southeastern regions of the United States, which have long histories of pork and ham production. As with other Anglo-American salads, the recipe for ham salad has many regional and family variations. Similar salads are made using chopped or ground bologna, Spam, and other cured or potted meats and sausages. Egg salad is part of a tradition of salads involving protein mixed with seasonings in the form of herbs, spices, and other foods, and bound with mayonnaise. Its siblings include chicken salad, crab salad, ham salad, lobster salad, and tuna salad. Egg salad is often used as a sandwich filling, typically made of chopped hard-boiled eggs, mayonnaise, mustard, minced celery and onion, salt, black pepper, and paprika. It is also often used as a topping on green salad. Egg salad can be made creatively with any number of other cold foods added. Bacon, bell pepper, capers, cheese, cucumber, onions, lettuce, pickle relish, and pickles are common additional ingredients. A closely related sandwich filler is egg mayonnaise, wherein chopped hard-boiled egg is mixed with mayonnaise only. Rémoulade (English pronunciation: /reɪməˈlɑːd/; French: [ʁemulad]) is a condiment invented in France that is usually aioli- or mayonnaise-based. Although similar to tartar sauce, it is often more yellowish (or reddish in Louisiana), sometimes flavored with curry, and sometimes contains chopped pickles or piccalilli. It can also contain horseradish, paprika, anchovies, capers and a host of other items. While its original purpose was possibly for serving with meats, it is now more often used as an accompaniment to seafood dishes, especially pan-fried breaded fish fillets (primarily sole and plaice) and seafood cakes (such as crab or salmon cakes). * France: rémoulade is made from mayonnaise to which is added vinegar, mustard, shallots, capers, chopped pickles, and/or fresh herbs (chives, tarragon, chervil, burnet). It is commonly used in céleri rémoulade, which consists of thinly cut pieces of celeriac with a mustard-flavored remoulade and also to accompany red meats, fish and shellfish. * Belgium: One of the condiments for frites, often sold at takeaway stands. * Netherlands: Often served with fried fish. * Germany: Mainly used with fried fish, and as an ingredient of potato salads. When marketed as “Danish remoulade”, it is used for the “Danish hot dog”, fish with boiled potatoes, dill and creamed spinach. * Sweden: Remouladsås – the French version – is a common accessory to fried or breaded fish dishes, and used as topping on roast beef. The Danish version is also available, and is used on a variety of dishes referred to as ‘Danish-style’, for example Danish hot-dogs, Danish smørrebrød and suchlike. * Denmark: An essential ingredient on open-face roast beef sandwiches (smørrebrød), along with Fried onion. Remoulade is also used for fish meatballs or breaded fillets of fish (e.g. cod or plaice) along with lemon slices. For french fries, the Danes can usually order tomato ketchup, remoulade or both, although in recent years mayonnaise has gained ground. In most regions it is used on hot dogs along with hot or sweet mustard, ketchup, fried or raw onions and pickled cucumber slices. * Norway: Primarily served with deep fried fish. * Iceland: remúlaði is a condiment commonly served on hot dogs, together with mustard, ketchup, and raw and fried onions. * USA: Typically served as a condiment with seafoods and certain vegetables. Fried soft-shell crab sandwiches may be served with remoulade as the only sauce. * Louisiana Creole cuisine: Remoulade often contains paprika and tends to be have a tannish or pink tint due to the use of Creole brown mustard like Zatarain’s, small amounts of ketchup, cayenne pepper, and paprika. According to Larousse Gastronomique, rémoulade is 1 cup of mayonnaise with 2 tablespoons mixed herbs (parsley, chives, chervil and tarragon), 1 tablespoon drained capers, 2 finely diced cornichons and a few drops of anchovy essence (optional). Some recipes use chopped anchovy fillets. The rémoulade used in céleri rémoulade is a simple mustard-flavored mayonnaise spiced with garlic and pepper. Rémoulade is classified in French cooking as a derivative of the mayonnaise sauce. Danish remoulade has a mild, sweet-sour taste and a medium yellow color. The typical industrially-made variety does not contain capers, but finely-chopped cabbage and pickled cucumber, fair amounts of sugar and hints of mustard, cayenne pepper, coriander and onion, and turmeric for color. The herbs are replaced by herbal essences, e.g. tarragon vinegar. Starch, gelatin or milk protein may be added as thickeners. Homemade or gourmet varieties may use olive oil (especially good with fish), capers, pickles, carrots, cucumber, lemon juice, dill, chervil, parsley or other fresh herbs, and possibly curry. Louisiana remoulade can vary from the elegant French-African Creole, the rustic Afro-Caribbean Creole, or the Classic Cajun version, and like the local variants of roux, each version is different from the French original. Creole versions often have tan or pink hues and are usually piquant. Louisiana-style remoulades fall generally into one of two categories—those with a mayonnaise base and those with an oil base, but sometimes both mayonnaise and oil are used. Each version may have finely chopped vegetables, usually green onions and celery, and parsley; most are made with either Creole or stone-ground mustard. Salt, black pepper, and cayenne pepper are also standard ingredients. In the oil- and mayonnaise-based versions, the reddish hue often comes from the addition of a small amount of ketchup. The sauce is often topped with paprika for the aesthetics as well as the flavor. Generally, acidity is added with the inclusion of lemon juice or vinegar. Other additions include hardboiled egg or raw egg yolks, minced garlic, hot sauce, vinegar, horseradish, capers, cornichons, and Worcestershire sauce. Central Mississippi has Comeback sauce, a condiment that is very similar to Louisiana remoulade. Mayonnaise (/ˈmeɪəneɪz/, /ˌmeɪəˈneɪz/ or in AmE also /ˈmæneɪz/, and often abbreviated as mayo /ˈmeɪoʊ/) is a thick, creamy sauce often used as a condiment. It is a stable emulsion of oil, egg yolk, and either vinegar or lemon juice, with many options for embellishment with other herbs and spices. Proteins and lecithin in the egg yolk serve as emulsifiers in both mayonnaise and hollandaise sauce. Commercial egg-free alternatives are available for vegans and others who want to avoid animal products and cholesterol, or who are allergic to eggs. Mayonnaise varies in color, but is often white, cream, or pale yellow. It may range in texture from that of light cream to a thick gel. In countries influenced by French culture, mustard is also a common ingredient, but the addition of mustard turns the sauce into a remoulade with a different flavor and the mustard acts as an additional emulsifier. Mayonnaise can be made by hand with a mortar and pestle, whisk or fork, or with the aid of an electric mixer or blender. It is made by slowly adding oil to an egg yolk, while whisking vigorously to disperse the oil. The oil and the water in yolks form a base of the emulsion, while lecithin and protein from the yolks are the emulsifiers that stabilize it. Additionally, a bit of a mustard may also be added to sharpen its taste, and further stabilize the emulsion. Mustard contains small amounts of lecithin. If vinegar is added directly to the yolk it can emulsify more oil, thus making more mayonnaise. For large-scale preparation of mayonnaise where mixing equipment is being employed the process typically begins with the dispersal of eggs, either powdered or liquid, into water. Once emulsified, the remaining ingredients are then added and vigorously mixed until completely hydrated and evenly dispersed. Oil is then added as rapidly as it can be absorbed. Though only a small part of the total, ingredients other than the oil are critical to proper formulation. These must be totally hydrated and dispersed within a small liquid volume, which can cause difficulties including emulsion breakdown during the oil-adding phase. Often a long agitation process is required to achieve proper dispersal/emulsification, presenting one of the trickiest phases of the production process. Though, as technology in the food industry advances, processing has been shortened drastically allowing roughly 1000 liters to be produced in 10 minutes. Commercial mayonnaise sold in jars originated in Philadelphia in 1907 when Amelia Schlorer decided to start selling her own mayonnaise recipe originally used in salads sold in the family grocery store. Mrs. Schlorer’s Mayonnaise was an instant success with local customers and eventually grew into the Schlorer Delicatessen Company. Around the same time in New York City, a family from Vetschau, Germany, at Richard Hellmann’s delicatessen on Columbus Avenue, featured his wife’s homemade recipe in salads sold in their delicatessen. The condiment quickly became so popular that Hellmann began selling it in “wooden boats” that were used for weighing butter. In 1912, Mrs. Hellmann’s mayonnaise was mass-marketed and later was trademarked in 1926 as Hellmann’s Blue Ribbon Mayonnaise. A typical formulation for commercially made mayonnaise (not low fat) can contain as much as 80% vegetable oil, usually soybean but sometimes olive oil. Water makes up about 7% to 8% and egg yolks about six percent. Some formulas use whole eggs instead of just yolks. The remaining ingredients include vinegar (4%), salt (1%) and sugar (1%). Low-fat formulas will typically decrease oil content to just 50% and increase water content to about 35%. Egg content is reduced to 4% and vinegar to 3%. Sugar is increased to 1.5% and salt lowered to 0.7%. Gums or thickeners (4%) are added to increase viscosity, improve texture, and ensure a stable emulsion. There are several ways to prepare mayonnaise, but on average it contains around 700 kilocalories (2,900 kJ) per 100 grams, or 94 calories per tablespoon. This makes mayonnaise a calorically dense food. There are egg-free versions of mayonnaise available for vegans and others who want to avoid eggs, animal fat, and cholesterol, or who have egg allergies. In the US, these alternatives cannot be labelled as “mayonnaise” because of the FDA’s definition of mayonnaise making egg a requirement. Well-known brands include Nayonaise and Vegenaise in North America, and Plamil Egg Free in the UK. In August 2015, the United States Food and Drug Administration sent out a warning letter to the San Francisco company Hampton Creek, objecting to the name of their “Just Mayo” product, which is not egg-based and therefore does not meet the U.S. legal definition of “mayonnaise”. Tartar sauce (in the UK, New Zealand and Australia, tartare sauce) is a mayonnaise or aioli-based sauce, typically of a rough consistency. It is often used as a condiment with seafood dishes. Tartar sauce is based on either mayonnaise (egg yolk, mustard or vinegar, oil) or aioli (egg yolk, olive oil, garlic, lemon juice), with certain other ingredients added. In the UK, recipes typically add to the base capers, gherkins, lemon juice, and tarragon. US recipes may include chopped pickles or prepared green sweet relish, capers, onions (or chives), and fresh parsley. Chopped hard-boiled eggs or olives are sometimes added, as may be Dijon mustard and cocktail onions. Paul Bocuse describes sauce tartare explicitly as a sauce remoulade, in which the characterising anchovy purée is to be substituted by some hot Dijon mustard. The sauce and its name have been found in cookbooks since the 19th century. The name derives from the French sauce tartare, named after the Tatars (Ancient spelling in French of the ethnic group: Tartare) from the Eurasian Steppe, who once occupied Ukraine and parts of Russia. Beyond this, the etymology is unclear. An idea of what people in the nineteenth century meant by naming something “tartar” can be found in a recipe of Isabella Beeton in “The Book of Household Management” of 1861, recipe no. 481, “Tartar mustard”, made of horseradish vinegar, cayenne and ordinary mustard. In her recipe no. 503, “Remoulade, or French Salad-Dressing”, she describes a preparation with tarragon that can hardly be identified with a Remoulade as standardized by Auguste Escoffier forty years later or as it is considered today. But she explains that the tarragon for her recipe of “Green Remoulade” comes originally from Tartary. In the days of Tsarism, the Russian properties in Asia south of Siberia were frequently called Tartary, especially when an exotic undertone was intended. Sauce Tartare might be a descriptive term for a tarragon mayonnaise named after the origin of the so-called Russian tarragon, which actually is rarely used for culinary purposes. In 1903 Auguste Escoffier gave a recipe for Sauce Remoulade (Rec. No. 130) with both mustard and anchovy essence, but he used only the term Sauce Tartare for it in the rest of the book. This is still common use in Austria and former Austrian regions like Bohemia, where Sauce Remoulade and Sauce Tartare are synonyms on restaurant menus. The German dictionary “Langenscheidt, Maxi-Wörterbuch English, 120.000 Phrases of 2002” identifies Tartar(e) Sauce as Remouladensosse. In the early era of the Haute Cuisine from about 1890 to the outbreak of World War I in 1914 minced filet of beef was dressed with Sauce Tartare and served raw as Boeuf Tartare or steak tartare with regard to the sauce’s name. Between the World Wars, until today, it came into fashion to serve the dish with regard to the raw unprocessed meat just with the unprocessed ingredients of the sauce. In fact, the Tatars have nothing to do with the sauce or raw beef steaks. Especially in the Haute Cuisine era, dish names were frequently selected from contemporary, fashionable, public issues to gain attention. Deviled eggs (US) or devilled eggs (UK) are hard-boiled eggs, shelled, cut in half, and filled with the hard-boiled egg’s yolk mixed with other ingredients such as mayonnaise and mustard, but many other variants exist internationally. Deviled eggs are usually served cold. They are served as a side dish, appetizer or a main course, and are a common holiday or party food. 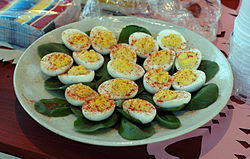 In parts of the Southern and Midwestern United States, the terms “stuffed eggs”, “salad eggs”, “dressed eggs”, or “angel eggs” are also used, particularly when served in connection with church functions, avoiding the name “Devil.” The term “angel eggs” is also used in association with deviled eggs stuffed with “healthier” alternatives. Cool hard-boiled eggs are peeled and halved lengthwise, and the yolks are removed. The yolks are then mashed and mixed with a variety of other ingredients, such as mayonnaise and mustard. Tartar sauce or Worcestershire sauce are also frequently used. Other common flavorings include: diced pickle or pickle relish, salt, ground black pepper, powdered cayenne pepper or chipotle chillies, turmeric, vinegar, green olives, pimentos, poppyseed, thyme, cilantro, minced onion, pickle brine, caviar, cream, capers, and sour cream. The yolk mixture is then scooped with a spoon and piped back into each egg “cup”. Old Bay, paprika, curry powder, cayenne, chives, and dill may then be sprinkled on top as a garnish. It may be further decorated with dollops of caviar, anchovy, bacon, shrimp or herring. Contemporary versions of deviled eggs tend to include a wider range of seasonings and added foods, such as garlic, horseradish, wasabi, sliced jalapeños, cheese, chutney, capers, salsa, hot sauce, ham, mushrooms, spinach, sour cream, caviar, shrimp, smoked salmon or other seafood, and sardines. The deviled egg can be seen in recipes as far back as ancient Rome, where they were traditionally served as a first course. It is still popular across the continent of Europe. In France it is called œuf mimosa; in Hungary, töltött tojás (“stuffed egg”) or kaszinótojás (“casino egg”); in Romania, ouă umplute (“stuffed eggs”); in the Netherlands gevuld ei (“stuffed egg”); in Sweden fyllda ägg (“stuffed eggs”); in Malta it is called bajd mimli (“stuffed eggs”). In many European countries, especially Belgium, France, the Netherlands and Germany, a variation is served known as “Russian eggs”. This consists of eggs cut in half, served with vegetable macédoine and garnished with mayonnaise, parsley and tomato. Contrary to what the name might suggest, the dish does not originate in Russia: its name derives from the fact that the eggs are served on a bed of macédoine, which is sometimes called Russian salad. In the Black Forest region of Germany, Russian eggs may be garnished with caviar. In Sweden, the deviled egg is a traditional dish on the Easter Smörgåsbord, where the yolk is mixed with caviar, cream or sour cream, optionally chopped red onion, and decorated with chopped chives or dill, perhaps with a piece of anchovy or pickled herring. Deviled eggs are a common dish in the United States. In the Midwestern and Southern U.S., they are commonly served as hors d’oeuvres before a full meal is served, often during the summer months. 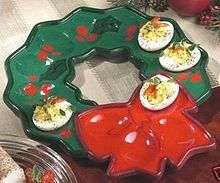 Deviled eggs are so popular in the United States that special carrying trays are sold for them. Prepared and packaged deviled eggs are now available in some U.S. supermarkets. In French cuisine, the other ingredients are most likely to be pepper and parsley. In Hungarian cuisine the yolks are mashed and mixed with white bread soaked in milk, mustard and parsley, often served as an appetizer in mayonnaise or as a main course baked in the oven with Hungarian sour cream topping and served with French fries. Other common flavorings of the yolks in the German cuisine are anchovy, cheese and caper. Thank you to Cathy L. for passing this Hint along!….